“Sydney” is my Aunt and Uncle’s Goldendoodle pup. 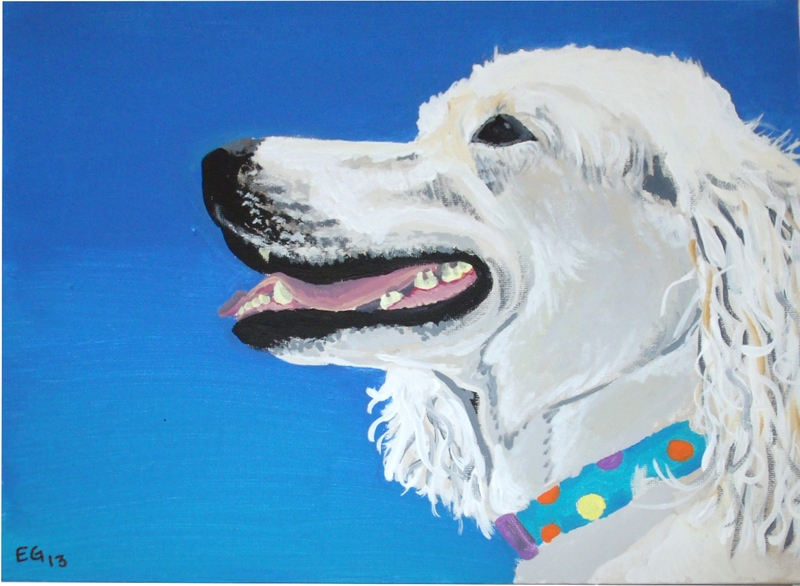 I painted this portrait for them and it now resides in their house! A Goldendoodle, for those who don’t know, is a “designer dog” – a cross between a Golden Retriever and a Poodle. They are very spunky, fun, and intelligent dogs, and Sydney is no exception to that! My cousins often find Sydney doing interesting things with their spy cameras when no one is home. It’s quite hysterical. This entry was posted in acrylic, animals, art, canine, dogs, golden retriever, goldendoodle, painting, pets, poodle, portraits, pup, puppies, puppy, Uncategorized and tagged acrylic, animal, art, dog, golden retriever, goldendoodle, painting, pets, poodle, portrait, pup, puppy on August 13, 2013 by Jumping Jack Studios.